The first Christian martyr in South Africa, Maqhamusela Khanyile, was shot on a hillside outside Eshowe, KwaZulu-Natal on 9 March 1877. To mark this event 130 years ago, the Premier of KwaZulu-Natal and the Evangelical Lutheran Churches in Southern Africa arranged a commemoration celebration on Kwa Mondi on 11 March 2007. Representatives from Norway were Anne Karin Kristensen as NMS representative, Kåre Kristensen, Director of SIK, Ingjerd Ofstad, retired missionary from South Africa and myself, Bente Ofstad Skeie, also working at SIK. The Premier of KwaZulu-Natal, Mr J. S. Nedebele and the Bishop L. Sibyia unveiled this new cross on the day of commemoration. 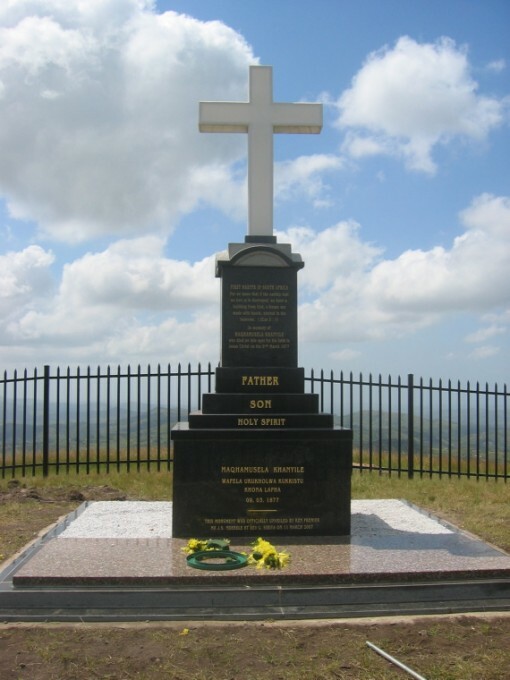 It is on the site of the old Martyr’s Cross, overlooking a large area of what was before known as Zululand. Further down the hill a grave stone has been erected where Maqhamusela was shot. When Rev. Ommund Oftebro came to claim the body for a burial, the body had disappeared, and this still remains a great mystery. The Maqhamusela Khanyile memorial cross, Eshowe, South Africa. Photo: Bente Ofstad Skeie, 11 March 2007.